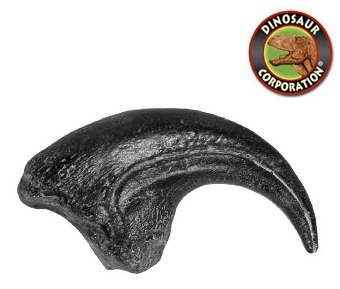 Allosaurus Claw. Fossil Replica. Allosaurus fragilis. Location: Jurassic Morrison Formation of Utah. * Material: Cast in durable Polyurethane resins. Allosaurus was a typical large theropod, having a massive skull on a short neck, a long tail and reduced forelimbs. Allosaurus fragilis, the best-known species, had an average length of 8.5 meters (28 ft), with the largest definitive Allosaurus specimen (AMNH 680) estimated at 9.7 meters long (32 ft), and an estimated weight of 2.3 metric tons (2.5 short tons).